Badhaai Ho Movie Review: Gajraj Rao is consistently convincing, but perhaps the most impactful performance is delivered by Surekha Sikri. Director Amit Ravindernath Sharma's Badhaai Ho deserves unstinted kudos. It not only dares to tackle a tricky theme, it does so with laudable finesse. This film is a worthy addition to the raft of adventurous, sure-handed genre-benders that the Mumbai movie industry has been delivering of late in a welcome rush. Badhaai Ho is a far cry from Sharma's debut film, Tevar, which was all fire and brimstone, a small-town love-and-vengeance concoction that allowed itself to fall prey to excess. In sharp contrast, restraint is the key in his sophomore effort. From the first outing to the second, he has clearly come a long way. Badhaai Ho is a sweet little gem informed with gentle wit and infectious warmth. The slice-of-life storytelling, which is appreciably enhanced by solid performances from a wonderful cast, is marked by control and sensitivity. The screenplay by Akshat Ghildial (who is also the dialogue writer) is shorn of clichés - an attribute that lends the film a veneer of freshness. It lasts all the way until the very end and helps it tide over the more difficult elements in the plot. With the actors on song, Badhaai Ho has a smooth, even feel that makes it an easy watch. This is a family drama with a difference whose appeal stems from the confident and steady manner in which it unfolds. Badhaai Ho is relatable despite the fact that it deals with a situation that isn't all that common, in real life or in cinema. Sharma knows his craft and demonstrates an acute sense of proportion, especially when he is dealing with the dramatic moments that spur the tale forward. 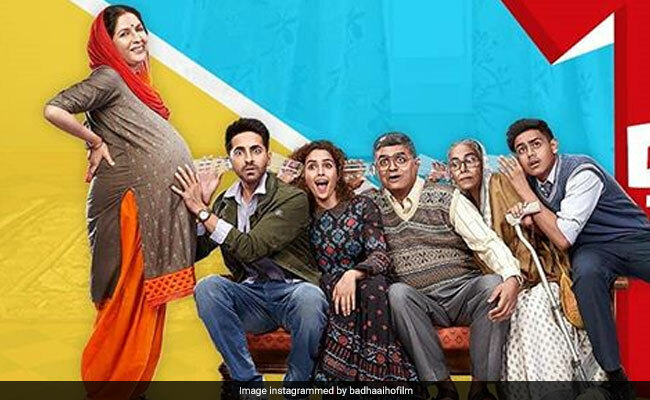 Set in Delhi, Badhaai Ho revolves around a pregnancy that causes a major stir in a middle-class family and the neighbourhood in which it lives. The would-be mother isn't some unwed girl, but a fifty-something mother of two grown-up boys, Priyamvada (Neena Gupta). The news is greeted with disbelief and disdain. Priyamvada's husband, Jitender Kaushik (Gajraj Rao), is a travelling ticket examiner is assailed by conflicting emotions. He toys with the idea of an abortion, but leaves the decision to his wife. She puts her foot down and opts to take the risk of bearing another child. Her elder son, Nakul (Ayushmann Khurrana), who has a corporate job, is in a tizzy when he figures out what is 'wrong' with his mom. The Kaushik family, which includes a younger son (Shardul Rana) and a grandmother (Surekha Sikri), lives in a modest railway colony where news of any domestic development spreads fast and wide. But Nakul manages to hide the fact that his mother is pregnant from his girlfriend and colleague Renee (Sanya Malhotra). But, inevitably, his success is short-lived. Badhaai Ho tells two love stories - one of the elder couple, the other of Nakul and Renee. The strain unleashed by the former tells on the latter: the younger couple are on the verge of splitting up when the class divide between them snowballs into a full-blown confrontation between the man and the girl's widowed mother (Sheeba Chadda). Nakul overhears Renee's mother badmouthing his family when she learns that Mrs Kaushik is expecting a child at an age when she should be concentrating on raising grandchildren. She describes Nakul's brood as "a circus I wouldn't buy tickets to" and asserts that "such things don't happen in families like ours". The script skillfully balances the intersecting strands as the two couples negotiate necessarily different sets of problems. Priyamvada and her husband have to reckon with the latter's temperamental mother, who appears to have no love lost for her daughter-in-law and is shocked out of her wits when the news of the late pregnancy is broken to her. The two sons are embarrassed no end, and have to face tetchy moments when friends begin to pull their legs. But at no point does Badhaai Ho slip into overt facetiousness - it goes through with its unusual construct with an absolutely straight face, never straying into territory that might be described as corny. That isn't a mean feat given the delicate crux of a story in which veteran actors are allowed as much play as two romantic leads. Gajraj Rao, in what is by far his most protracted role in a Hindi film, is consistently convincing, oscillating between elation and embarrassment without missing a single trick. Neena Gupta is outstandingly measured in her interpretation of the woman grappling with the repercussions of an unplanned pregnancy. But perhaps the film's most impactful performance is delivered by Surekha Sikri as the crabby old woman who never shies away from speaking her mind. Yes, among the most impressive aspects of Badhaai Ho is the way the director harnesses the rest of the on-screen talent pool and makes every character, even the minor ones, count. In the scene where Ayushmann Khurrana's character harangues his girlfriend's mother in her own home, both he and Sheeba Chadda - she does all the talking, she only listens - are in top form, as is the director himself. The set-up is replicated a little later in an apology sequence in which Khurrana is the sole talker and Chadda is the listener. Sharma extracts equally useful performances from Alka Kaushal (as Mr. Kaushik's Meerut-based sister, Guddan), Alka Amin (as her elder sis-in-law) and Shardul Rana (as the younger son).